So, he's wary about ovals. Hey, I'm happy he's up front about it. Places like Indianapolis should demand respect, and not be treated with nonchalance. IndyCar's first Russian driver seems to have it right on the money there. Ovals are strange beasts. Some drivers can come in and take to them quite well, while others drivers can be top-notch in other aspects, but never really be at home on ovals big or small. Aleshin will follow several other past and present IndyCar drivers with Formula Renault 3.5 experience. Besides racers like Charlie Kimball and Pippa Mann, there is Bertrand Baguette, whom Aleshin succeeded as FR 3.5 champion back in 2010. Aleshin is his own driver, though; from what little I've seen of him on-track, I'd peg him as very cool and generally professional when it comes to his racing. I think he could be a good teammate for Pagenaud, at least on the street and road courses. He also has rough a half-decade more open wheel experience than Vautier. Oh, he's still an IndyCar rookie for 2014, but there are reasons to suspect he might be a little more settled to start out. Ultimately, do I think Aleshin rises to the level of talent possessed by his new teammate, one of IndyCar's rising elite drivers? No, but I think he has enough to make some serious Top 10 runs and possibly help out that team. If that's the result this year for SPM, then I think it could be regarded as a positive move. There is, of course, more fallout to this story. Tristan Vautier's seat at SPM always seemed a little shaky, but you get the idea he'll land on his feet, even if it's outside of IndyCar. If he doesn't make a full-time return to the series (which doesn't sound too likely at the moment), I'm still glad he got a shot. It was a tough rookie year, but he seemed like a really good kid. He's fast, and he'll do well enough, be it in sports cars or elsewhere. 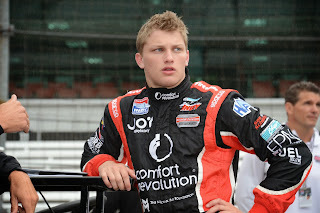 There's also the question of Sage Karam's destination in 2014. I interviewed this year's Indy Lights champ a few weeks back, and since then, I've had fits trying to figure out just where to slot him for 2014. SPM seemed a possible location, given his association with that team in Lights, but now we know that's not in the cards. Now, there's one less possible seat for Karam, and all eyes turn towards places like the KV Racing seat. Mikhail Aleshin and the Schmidt Peterson Motorsports seat might not seem like a massive bombshell on the surface, but there are reverberations there all the same. For IndyCar drivers without a ride, the pool of available seats (already small to begin with) dries up just a bit more A parting thought on this Monday: is Aleshin the only new European driver we see, or are others getting ready to make the jump across the pond? This may come as a shock, I know, but for all his good qualities, Ed Carpenter is not a street and road course ace. On the other hand, Mike Conway has amply proved that he is. That's why Friday's announcement of Ed Carpenter stepping aside for Mike Conway for the twisty weekends makes an abundant amount of sense. Here, we have two drivers who are the mirror images of one another when it comes to IndyCar. Just as Carpenter has shown he can win and grab the pole on an oval, Mike Conway can be counted on to do the same in the concrete canyons. That's precisely why so many fans have talked about such a move for a while now. This makes as much sense as any decision we've seen in the past year. Carpenter should again be a threat on the ovals (including the Indy 500), while it will be fantastic to see Conway compete during weekends such as Long Beach and Belle Isle. That's not to say Ed Carpenter couldn't have stayed on for the street and road courses. It's worth noting that Carpenter worked very hard with driving coach Lee Bentham on improving his craft over the past year, and while he still didn't set the world on fire or manage a street course Top 10, he was still much better than in years past. I admire his dedication just as much as I admire his willingness to do the right thing for Ed Carpenter Racing when it's all said and done. After all, Mike Conway in for the road and street courses should mean more TV exposure for Fuzzy's Vodka. Carpenter did what he could, and when it was time, made the even smarter play. This is also a perfect situation for Conway, who decided he was finished with ovals before the 2012 season finale. He fits into a team where his skills will be of immense value, and will work to make the team a competitor just about every weekend. Better yet, the team should see no drop-off when it comes to the weekends when Conway isn't in the car. Mike Conway is as calm as they come, and one would think that would go well with the very even-keel Ed Carpenter. They just might be the calmest duo in the paddock. You could have the two suspended over a live volcano by their toes, wearing belts full of nitroglycerin, and you might get a combined heart rate from the two of ten, maybe eleven beats per minute. There will come a day when Ed Carpenter is finished driving an IndyCar, and focuses all of his attention on Ed Carpenter Racing. While I'm hoping he has many great oval races in front of him, with decisions like this, I'm pretty sure he's going to be an excellent full-time owner when that time comes. Chevy should also be happy--one of their teams is going to be in line for top finishes quite a bit more in the season to come. Sometimes, there are decisions made that are such no-brainers that they sort of speak for themselves. In 2014, we should see the decision of Ed Carpenter Racing to add Mike Conway speak volumes on the track. So, just like that, it’s over. The racing career of Dario Franchitti—four-time IndyCar champion, three-time Indy 500 winner—is over, on the advice of doctors. We all know his Houston crash was a nasty one, but it was hard to even envision Dario retiring, even as we knew he was in the sunset of his career. Obviously, the most important thing is Dario’s safety. He’s no accident to some big hits over the years, and in an era where we are becoming increasingly aware of the toll repeated impacts can have on our athletes, certainly that has to be in the back of anyone’s mind. If he isn’t in a position to come back medically, then that’s the final word on it. There will be a time to speculate on how this is going to shake up the #10 seat and the idea of 4 entries at Ganassi, but that can wait. Let’s talk about Dario himself for a moment. Let’s face it, we’ve often teased Dario on this very site for sometimes coming off as aloof or entitled, but the reality is (red car envy aside), he’s pretty approachable around the paddock. Additionally, out of all the IndyCar drivers, has seems to have the most appreciation for the full history and tradition of the sport. From his idolizing of Jim Clark to his deep understanding of the history of the Indianapolis 500, he’s a student and scholar of the sport, just as many of us would probably consider ourselves to be. He also has been one of the greatest IndyCar drivers, coming in second only to AJ Foyt in season titles, and being considered by any measure one of the most gifted driver to ever take to the Indianapolis Motor Speedway. In many ways, he is also a throwback, competing without reserve in open wheel, stock cars, and sports cars, and always willing to get behind the wheel and work at his master craft. Ultimately, whether we were rooting for him or against him, there can be little doubt we were watching one of the historical greats perform. He doesn’t need a single additional lap to make his career Hall of Fame-worthy. As for what’s next for Dario, once he’s ready, ABC or NBC Sports would be immensely wise to grab him for spot in the broadcasting booth. On the occasions where an early departure from a race has allowed him to join the coverage team, he has done a fine job. His insight, experience, and evaluation (and let’s be honest, the accent helps) would be extremely welcome and provide some lift to the current coverage. The news of Dario Franchitti’s retirement hit me like a thunderbolt yesterday. I’m sure many of you feel the same. Now, we go forward, wishing the best to one of IndyCar’s veteran leaders, and a proper champion many times over. Dario goes to Scotland, hopefully to make a splendid recovery and eventually find a vital place in IndyCar in the next stage of his racing life. Let’s save arguing for his replacement or on his exact place among the all-time greats. Today, let’s take the time to thank and appreciate a splendid professional driver and paddock leader who has shown a such true love, deep regard, and pure excitement for this sport. I'll preface today's article by wishing all who served a happy Veterans Day. Your sacrifices and service remain an inspiration. From the bottom of my heart and the hearts of my family, thank you. Late last week, we heard about some of the changes Mark Miles and company have planned for Qualifications at the Indianapolis Motor Speedway. We all know you can't say "changes" and "Indy 500" without inciting a full riot--I personally once went ballistic because someone said Jim Nabors needed to be replaced--but I do think we need to take a look at what might be planned. For the past two years, Bump Day has been a pretty flat experience. Outside of Michael Jourdain's ill-handling car (which did not even get to make an attempt), no one who has actually taken to the track has ended up on the outside looking in. So while Pole Day has been a great day of fun, Bump Day has generally been an extended practice session. What Miles is proposing as a change follows the possible lines of having the field filled and bumping on Saturday (formerly Pole Day), with positions 1-9 also determined to go for the pole Sunday. On Sunday itself, the order of the field would be determined, and the pole shootout would take place. The idea is that this balances the action and drama across two days, instead of mostly one. Right now, it's tough to see the 500 getting more than 1-2 additional entries above 33. Another engine manufacturer would help, as would lowered costs. Obviously, those are challenges outside the scope of this focus, which is changing the current format into something that appears to try to work within present realities to make both days more satisfying. That's why I'm cautiously optimistic that this is a good change for the present situation. You're giving better fan value to two days instead of one. Saturday remains important for filling the field, any sort of bumping, and determining who gets to go for the pole. Sunday will see who will be in the catbird seat for the race itself, and see who is stuck towards the back. It gives both days value. I remain an Indy 500 traditionalist. I view any changes to the 500 with a healthy dose of skepticism. But there are times when change needs to be tried. If there was never any change, we would still have pole position determined by entry date, up to 40+ starters starting the race instead of the now-traditional 33, and (gulp) 25/8 qualifications. Would I prefer a Bump Day with 8-9 drivers vying for the last spot in the field? Sure, but I also know that's probably not in the cards for 2014. Within our present reality, I'm ok with this time of change--with the hope that in time, by other changes and successes, the car count goes back up, and we're able to revisit the format. No, this won't bring weekend qualification crowds at Indy back to their 70s/early 80s levels. That was a unique phenomenon, set in a world that had fewer distractions and forms of entertainment. But that's not to say we can't see a nice rise in attendance for Sunday. Of course, this is not a fix-all for any challenges or improvements facing IndyCar. It will be good to see speed records again challenged, which should do its part. Another engine manufacturer would help with car count, and someone much smarter than me could probably write a Bible on reducing the costs of competition. But I do think when we look at these potential changes to qualifications through the correct lens, and not as some panacea it was never intended to be, it's worth seeing how it goes. As a side note, writing anything about the Month of May never fails to elicit some strong commentary and emails, be it the addition of the road race or changes to qualifying. I recognize there are heated passions at work here, and that makes any change difficult for commentary. I welcome your comments within that same spirit, and realize even if we might disagree, we all want an enjoyable Indy 500 experience. Four years ago, Sage Karam won the USF2000 championship, setting him on a challenging road on the Mazda Road to Indy. After two years in Pro Mazda, he made the jump to Indy Lights, where he fought off close competition to be crowned 2013 Lights champ. Now, still only 18 years old, the prospect from Nazareth, PA has charged to the front of the next wave of INDYCAR ladder prospects, those drivers who have fought their way up the open wheel ladder and are looking to jump to IndyCar itself. It's been an impressive rise, and the young American would seem to be a great story on homegrown talent making good. Not long after the title celebration had ended, Sage sat down to an interview for IndyCar Advocate. What follows is Karam's view on the Lights scholarship, his 2014 hopes, Lights competition, his status as a budding oval ace, his chosen path in open wheel, and much, much more. Check it all out below, and stay tuned to see what Karam's 2014 future holds. Sage, thanks so much for your time. So, champ, when did it sink in that you were this year’s Indy Lights champion? SK: Thank you. The morning I woke up after Fontana and thought to myself, wow, we did it! I was bombarded with interviews and photos as soon as the race was over and it was a whirlwind of activity. Don't get me wrong, it was an honor to be involved and to be so busy. It was really exciting and the banquet was amazing. IndyCar made me feel like a champion for sure! I still go on IndyCar.com and check the standings to make sure I really won. You had to hold off pretty lively challenges not only from Carlos Munoz, but from guys like Gabby Chaves and Peter Dempsey at times, too. Who was your toughest opponent this year, and who do you think showed they deserve to also move up to IndyCar for 2014? SK: Carlos (Munoz) was expected to win it because it was his 2nd year in FIL and his Indy 500 performance brought legitimacy to any question about the talent pool in FIL. So we all knew he was going to be tough, especially in an Andretti car. I raced there (AA) and I know how bad they want to win. Gabby (Chavez) and Jack (Hawksworth) had all my data so it was difficult to beat them on car setup alone. I was always open with my info, but as the season started to near the end, everybody started to shut down the flow of info to me, which was understandable. I'm not going to lie, it was fulfilling to beat Jack and Gabby on equal equipment after they defeated me in the Star Mazda championship last year. But I just can't narrow it down to one toughest opponent, because the top guy changed after each race several times. You look at Dempsey winning the Freedom 100 and I think the championship lead changed four times throughout the season? Not to sound like a cliche, but I think at times I was my own toughest opponent. I was the youngest driver in the series and I came into the season with the least amount of testing than any other FIL driver - a day and a half total. I wasn't even old enough (18) to test until 2 weeks before St. Pete. If you look at the mistakes I made at Toronto and Mid-Ohio, it probably made winning the title a little bit more difficult than it should have been. I beat myself up pretty good after Mid-Ohio and I think Michael Fux calling me in, identifying the problem and straightening me out was the biggest turning point in the season. Everyone knows the car count in Lights wasn’t ideal this year, but it seemed like it was really tough competition week in and week out. We’ve all heard about the need for drama and rivalries in IndyCar. The core of the Lights drivers—you, Gabby, Jack Hawksworth, Peter, Zach Veach, and the rest—how much did you hang out away from the track, and how well did you get along? Conversely, anyone you’d happily take to the woodshed (on track) again if you had the chance? SK: End of the day, we all respect each other. As the season progressed, we hung out less and less. Although Gabby and I were able to keep it tight away from the track, on the track we were vicious competitors. There were a couple of times some guys would yap their jaws in front of the crowd knowing they could get away with it, but when we were alone one-on-one, they would get quiet (haha). The top five guys raced each other hard, and we all had our dirty moments. Nobody can deny the level of competition; we had part-time Indycar drivers...we had a Pro Mazda champion...we had a USF2000 champion...former F3 and GP2/GP3 racers and even sports car drivers. So, I am not sure what other competition could come to the table, but even if you added more average drivers just for the sake of car count, it wouldn't have changed the title hunt much, I don't think? I don't want to sound cocky, but I only missed one lap all season (Toronto), so I think more cars may have actually helped my championship run, because I think the DNF's others had would have been more damaging if there were more cars. If car count is the only criticism of the series, then I would say we have a pretty good thing here and winning the championship with the quality of drivers like we had, made it all that much better. Can you imagine winning a championship of 20 cars with a bunch of junior varsity drivers and teams? I am not into that at all. I was never in a press conference when anybody criticized the quality of the drivers or the teams, and THAT says a lot. Karam is on the verge of realizing his IndyCar dream. What does the scholarship to IndyCar do for you? Does it specify different amounts based on whether you’re going full-time or part-time, or is just a lump sum to take to a program? Also, I know it’s early, but are you tracking for full-time or part-time in IndyCar for 2014? SK: From what I understand, it's a million dollar scholarship no matter which team I select, but it has to be for a full season ride and with a secure team. For me personally, I have no intention of doing a part-time season...Mazda awards the scholarship to put towards a full-time seat in IndyCar if you win Indy Lights, and that's my goal 100%. I did everything that was asked of me. My management team of Mickey Ryan and my long time sponsor Michael Fux are helping to make these decisions for me, but I am hearing nothing but a full time seat in the IndyCar Series. We are fortunate to have a sponsor like Mazda willing to do this for drivers. Ideally it would be great if Mazda had their own team at each level and offered it to the winner - kind of an automatic thing and we didn't have to negotiate deals. To answer your question, the scholarship certainly opens the door to IndyCar a little wider, but there is a quite a financial gap to fill yet. I need to connect with a corporation that has an appreciation for what I do and understands the benefits of being a part of it. I would love to bring some help to Comfort Revolution to get 2014 finalized. It's cool to see my career and Comfort Revolution grow together. Hopefully Mazda will find the need to utilize me in a sports car race like Daytona 24…hint, hint..haha. Again, I know you can’t go deep into specifics, but how many teams have you been talking to about putting together a 2014 program? SK: As of today, I think there have been about 4-5 IndyCar teams that have contacted my management team to some degree. I am unsure of the progress and I choose to stay out of those things until talks get a little more serious. When I get the call that a deal is on the table, I won't question why, where or what team. My managers have my best interest in mind and I have no doubt that they can get it done. It's crazy that a million bucks still doesn't mean all that much towards an IndyCar season. To me, a million dollars is like the world! IndyCar has never been a plan B, or a fall back plan for me because another direction didn't work out. It (IndyCar) is something I wanted ever since I can remember. I know my greatest day in racing is ahead of me and it's in an IndyCar. Coming into IndyCar, how important is it to you that your program include such short ovals as Milwaukee and Iowa, where you have had so much success? How about Indianapolis? I know you have talked before about being really close to the dream of the Indy 500. Did the Freedom 100 this year give you any insights as to what it’s like to race there in May? SK: Well the oval racing is where I feel real comfortable. I have 12 podiums out of 12 oval races in the MRTI. I would hope that my best chance of showing well in an IndyCar would be on an oval. Besides, if you win the oval at Indy people tend to make a big deal of it sorta of (haha). I consider Indy sacred ground, period. I see Tony Kanaan, who experienced everything in racing, and the excitement and satisfaction he got out of winning the Indy 500, and it makes me want to win it even more. I have always been a high risk and high reward type of driver. I think that style rewards you on the ovals. Your rise through the open wheel ranks has been rather meteoric. Would you ever see any benefit to doing something like Carlos Munoz or Sebastian Saavedra did—do a partial IndyCar schedule and run Lights races for the experience and seat time? Or do you feel like it’s all IndyCar from this point forward? SK: Well if meteoric means quick, then yes that's me haha. I wouldn't say that their (Carlos/Sebastian) program is necessarily the best route for me. I am not in this situation by accident and I came through the ladder system quickly because I earned it. I'm not saying they didn't earn it of course, but our situations are very different. The training process (MRTI) works and I won on every level and I feel that I am properly prepared. In fact I never competed in any other race series other than a MRTI sanctioned event. Hopefully I am a credit to the professionalism and degree of preparation or instruction that our ladder program provides. I came out of cadet karts and straight into cars at 13 years old. I am the first driver to come through it (MRTI) at every level and have won 2 of the 3 championships and have won races at every level too. I would think my age is an asset not a deterrent to select IndyCar teams and their ability to groom me. I mean, you gotta get your feet wet sometime, right? The trick is to get into a team that has a confident owner and sets realistic expectations for my rookie season. I would like to be with an owner that works with me and takes pride in developing me. I know there is an owner or two out there that can make a huge difference in my career, and maybe change the landscape of IndyCar. There is no doubt in my mind that I can adapt, but I also know it's going to be a real challenge, unlike any other challenge that I have ever faced. Let’s talk about your sponsor for a minute, who seems to have supported you as well as any ladder sponsor out there. Will we be seeing Comfort Revolution on the side of the car for 2014? SK: I can't imagine racing without Comfort Revolution or Michael Fux. Lets' face it, without him, I wouldn't be racing. Comfort Revolution is on the side of everything I own - even my bicycle! Michael treats me as his son and we share a special relationship. The thing about Comfort Revolution that sets them apart from other ladder sponsors, is they are the company that contribute to IndyCar off the track as well. You always see them at charity fundraisers and events of goodwill. Michael has shown a sincere interest in developing me as a person, not just as a racer. For example, Comfort Revolution funded my team for the Dan Wheldon Pro Am karting event this year. Michael Fux made it clear to me my role in charity and demands that I give back. I wouldn't want it any other way either. I would hope that Indycar and it's fan base embraces the relationship with Comfort Revolution and what they bring to the sport. Looking back to Sage Karam one year ago versus Sage Karam now, in what area have you developed most as a driver? SK: That's a great question. I heard it many of times coming into this season that I am an extreme raw talent but needed to be groomed. I feel Sam Schmidt's crew took my driving to the next level and polished me up. I learned how to take a 3rd place car and finish 2nd with it. I think they made me a more patient driver too. The team demonstrated the importance of focusing on the right things and not letting little things, or things that aren't important, stand in the way. Winning is all that matters to me, and when the team has that same philosophy, that's when championships are won. Moving to Indy as an 18 year old by myself and not knowing how to cook or do laundry was a wakeup call. I certainly learned to appreciate the things my parents have been doing for me to this point. If you ask my engineer what I brought to the team this year, he will tell you that I brought charisma, an extremely competitive attitude and I made sure that the team felt appreciated. The best compliment I ever received was after I won the FIL title, my engineer thanked me on the radio for pushing the team to win. SPM never needed motivation to win, but I think it's important that your crew feels your desire to prepare to win. You’re living in Indy now, right? What do you like about the city and the area, and what do you miss from Nazareth and Pennsylvania? SK: Well actually my parents moved me back last week from Indy. Indy is great, but you have to have a lot of money to live there because there are so many things to do! Sam insisted that I move to Indy and mature. I told him we couldn't afford rent, etc. He asked me if I really wanted to move or not? I told him if it would give me a better chance of winning the championship, then I would. He found me a sponsor to fund my rent and personal training at Pit Fit. I will never forgot that. Not too many owners would actually go to bat for you at this level and actually find sponsorship, but Sam did and I'm extremely grateful. Al Lewis was my associate sponsor and mentor while I was in Indy. He was a great go-to guy. The most difficult thing about moving to Indy was missing my family and friends. Do you still keep in touch with any of the Andretti clan—you know, that “other” racing group from Nazareth? SK: Yes, Marco was one of the first guys to text me after a good race weekend result. When I won the FIL championship, it was an honor to have Mario tweet about it as well. There's no denying that I started racing because of my family's admiration of the Andretti racing legacy. We started the USF2000 Championship with Michael's team and now the question of my relationship always comes up. Hey, at the end of the day, Michael Andretti gave me my start in cars, he treated me like a professional and I will never forget what he did for me as a young driver. I owe him a lot. The bottom line is that I respected him when he was a driver and I now respect him as a team owner. Whatever drama people try to create about our relationship at this point is on them, not us. I don't know all the details of why we didn't race for Andretti this past season, but I'm certain it was just a business decision and certainly nothing personal. That's the way I have to approach these types of situations. In the end, I would also say that things worked out well for me this season, right? What does that offseason regimen and schedule look like? How Did We Get Here? Pt. 2 When Did It Go Sideways? Back in the saddle again…..Really!